So those of you who first meet me back in my 'The Soul of Hope' days will know that I was adopted. When I was just three days old, I was brought from the hospital to my parents house as a foster child. They loved me soooo much they just had to keep me and the adoption was finalized a little more than a year later. I grew up always knowing I was adopted - as I stood out like a sore thumb from the rest of my family they couldn't very well keep it a secret now could they?! And for the most part I was okay with it. About ten years ago, I went to find my medical records through the state I was adopted in. They did not turn up with much and asked me if I wanted them to track down my birth family. I casually said yes, not having thought it through in the least. The next few years I started to get to know some of the members of my birth family, but my birth mother did not want anything to do with me (this, evidently is quite rate). And I was okay with not having anything to do with her, I did not (and still do not) want anything from her, but I wanted to be the one who set down the rules. As much as my parents loved and wanted me - it is hard to forget that the one person you are most connected to for those nine months you are developing did not love nor want me. And I may never be ready to confront that person (talk about a long grudge!). I was on a quest , as Alison (see below) says, "to find out why I am who I am". It was very emotional and hard for me and eventually I stopped contact with the people I had been talking to. 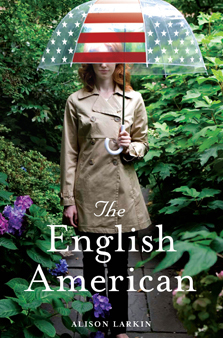 A year ago I was in the bookstore and just happened to stumble upon a book called The English American. This book ended up being so good (and I am not alone thinking that - it has FIVE stars on Amazon! )- hit on the subjects of being adopted, finding one's birth family and dealing with the feelings of one's adoptive family all wrapped up in a fictional tale of Pippa Dunn. After I read the book I went to the authors website. I saw that she was speaking near me in a few months and planned to go meet her. In the meantime, I sent my mom a copy of the book (and she LOVED it too!). Once I meet Alison, all these emotions and unresolved issues came up about my being adopted, and my birth family (my birth mother to be more precise) and she suggested I start looking for a adult adoptee's discussion group - and she even went so far as to find one FOR me! It was so comforting to know that there was at least ONE other person out there who felt as I did and the fact that she was very nice and truly funny made it easy to approach her and talk to her. And after attending the discussion group I discovered that there were even more people feeling the way I do, acting the way I do, and reacting the way I do. It was amazing. Since then, very recently, I have opened the lines of communication with 2 members of my birth family (took me a while, but I was able to track them down). I chose the two people who I felt most connected to 10 years ago. So far it is going well. 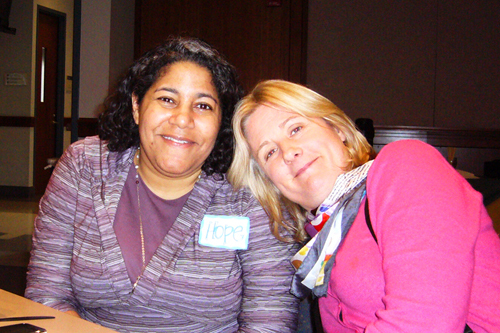 I got to spend some more time with Alison this past weekend at the Barker Foundation's annual conference (that's us in the photo below)- and it was wonderful. She opened me up to a whole world of people who completely understand me a way others never have. And for that I am forever grateful. She is working on her second book now, and her first book has been optioned for a televison show by the same guy that does Grey's Anatomy! Even if you are not adopted, or do not know anyone who is, you should read her book, it is funny, touching and just a really, really great book. In many ways it's my fellow adopted folks who I consider to be my 'real' family. I love my adoptive family to pieces, but they don't always 'get' it in the way other adoptees do.